There’s nothing quite as sweet as a newborn photoshoot. Those little swaddled babies with their teeny-tiny toes and flower headbands — it’s almost too cute to handle. 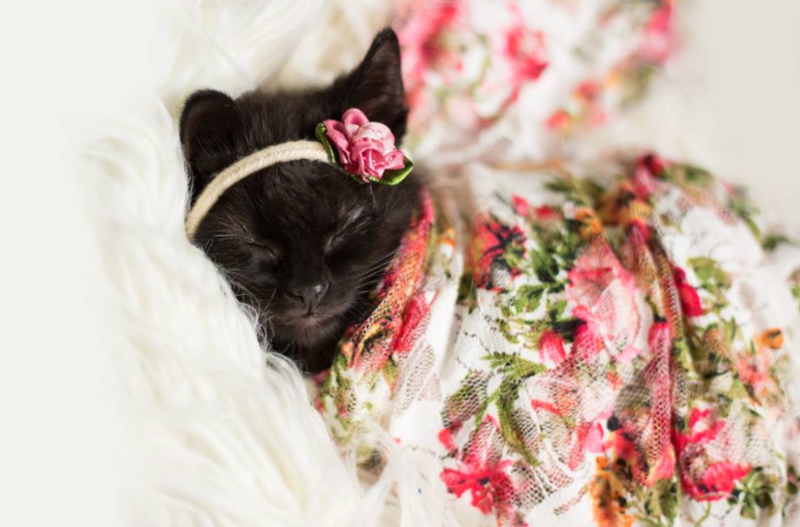 One woman staged the best newborn photoshoot ever, except she didn’t photograph a newborn baby — she curated a photoshoot with a newborn kitten. "We thought it would be a quick, funny, cute little shoot, [we had] no clue it would be this crazy!" "Luna was sleeping when I picked her up, she didn't notice or mind me covering her in a wrap. We had to wake her up to get her open eye pictures, and then she fell right back asleep." Then Schaub’s daughter Amelie, dressed as Alice from Alice in Wonderland, hopped into frame and nothing was the same. Schaub said that after posting her Luna photos, people from all over the world contacted her and told her how in love they were with her photoshoot. She decided that she would make a calendar to share the love and raise money for Save-a-Stray, a St. Joseph, Michigan-based animal rescue organization. According to Mashable, as of this morning, Schaub’s calendars have raised over $2,000. Perhaps Kitty Schaub has struck gold on a new way for pet parents to show their undying love for their fur babies. Although, if we tried to swaddle our cats, we have a feeling things wouldn’t go so smoothly!